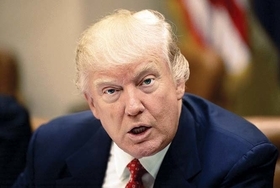 The release of President's Trump's budget on Thursday has drawn ire from public health advocates who say the cuts being proposed would put people at risk while helping to exacerbate a shortfall in healthcare professionals. The $1.1 trillion proposal would increase defense spending by $54 billion while calling for large cuts to domestic, discretionary programs. The Environmental Protection Agency is slated to take one of the largest cuts under the plan. Its budget would decrease by $2.6 billion, or 31%, over 2017 levels. The move would result in a loss of approximately 3,200 positions at the agency, and eliminate Obama-era initiatives such as the Clean Power Plan, which sought to reduce carbon emissions from power plants to combat climate change. The budget does away with funding for regional restoration efforts such as the Great Lakes Restoration Initiative and the Chesapeake Bay Program. Illness caused by climate change cost the U.S. healthcare system $14 billion over the last decade, including more than $700 million in direct medical expenses. Trump's budget also seeks to cut $403 million in funding to train people to go into nursing and other health professions, stating that there is a lack of "evidence that they significantly improve the nation's health workforce.” Trump instead seeks to uphold existing scholarship and loan repayment programs for health professionals that agree to work in medically underserved areas. “Eliminating more than $400 million in health professions and nursing training programs would jeopardize efforts to foster a diverse workforce and to enhance culturally competent care for the most vulnerable patients,” Dr. Darrell Kirch, president and CEO of the Association of American Medical Colleges, said in a written statement. Trump's budget does call for a $500 million increase from 2016 levels in funding for opioid abuse prevention efforts and to expand access to treatment. The plan also calls for investments toward improving mental health; the creation of an emergency response fund to address public health outbreaks; as well as reforms to the Centers for Disease Control and Prevention that would provide states with $500 million in block grant funding to handle their public health concerns. But the budget never provides specifics as to how much the administration would like to see invested in mental health, or where the money it calls for to fight opioid addiction CDC block grants would come from. Overall, the plan cuts HHS' budget by $15 billion, down nearly 18% from 2017 levels. It eliminates anti-poverty initiatives such as those that assist families with their energy costs, and a $4.2 billion program that funds local initiatives at combatting poverty. Poverty, homelessness, lack of stable housing and food insecurity have all in recent years been identified as negatively affecting health outcomes.